Brighton and I and occasionally Andrew, can be found on a lazy Sunday morning having breakfast. 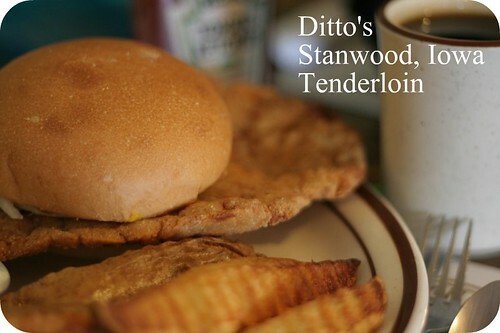 We occasionally go there for lunch or dinner and scoop up their huge nummy tenderloin. Service is usually pretty good, they’re often busy and so it may take a while to get your first cup of coffee, but besides that, you won’t wait long. The owner can often be found in the kitchen in the morning and early afternoons. Speaking of coffee, they serve Farmers Brothers coffee, which is usually served at these kinds of little diners. 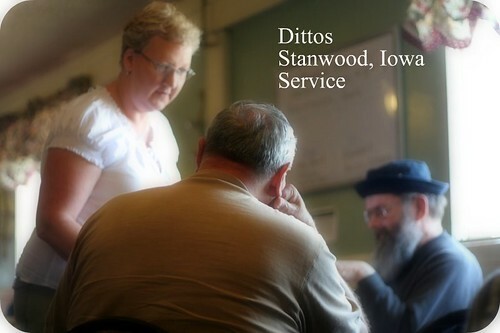 Dittos is located on Highway 30 on your way out of Stanwood or on your way into Stanwood – depending on which way you’re coming – or going. Stanwood is on the north side of Hwy 30. You can’t really miss it. And you shouldn’t. Posted on September 9, 2008, in Americana, Breakfast 24/7, Family Friendly, Lunch Anyone? and tagged breakfast, coffee, dinner, dittos, eat local iowa, Eating establishment, eatlocaliowa, Food, homemade, Iowa, Lunch, pie, tenderloin. Bookmark the permalink. 1 Comment.